Today, we are pleased to welcome back guest author Ashley Webb. 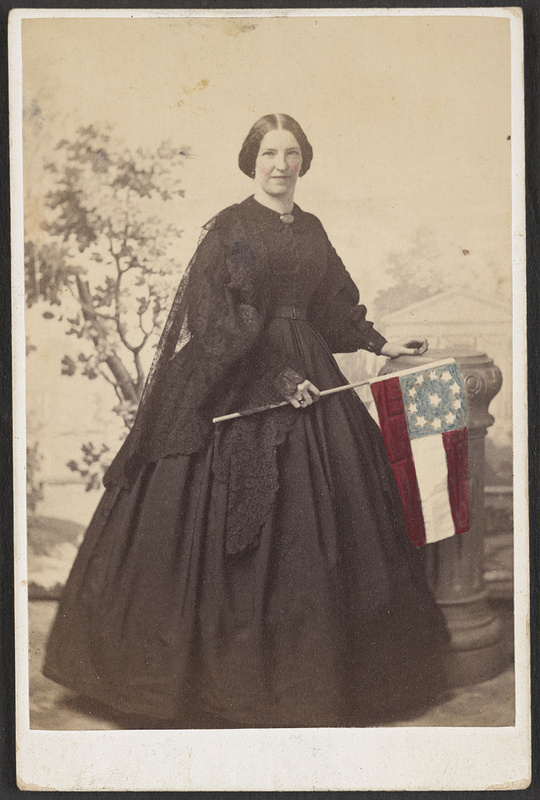 Mrs. Ridgley posed with the Confederate flag in this photograph, c. 1861-1865. It is much like the one Sarah Dawson would have made and worn in May, 1862. Courtesy of the Library of Congress. As a social historian, I love reading detailed diary entries that capture a single moment in time. Diaries provide an intimate glimpse into an author’s thoughts and feelings, as well as provide an accurate account of day to day happenings. For many Southern women during the Civil War, keeping a diary was a way to record the hardships of everyday life, and if not as a record, then as a way to pass the time when travel was difficult and social visits were non-existent. While many women’s diaries focus on the mundane aspects of everyday life, they highlight social status, as well as a woman’s ongoing role with the war. Many Southern women wrote as a means of defying Union sentiments, as well as a way to reinforce their views quietly when verbalizing their thoughts and opinions had repercussions. The diary of Sarah Morgan Dawson is no exception to this. Sarah’s change in feelings for the Federals is quite unique. The majority of Southern sympathizers did not have the same compassion toward Union officers and soldiers, especially as Union troops continued to push through the south. Many families were forced to flee their homes or were left starving and penniless as Union troops ransacked and burned cities and plantations on their march south. Diaries and letters are riddled with accounts of Union atrocities. Perhaps Sarah realized the weak and unfounded principles on which the war continued, or that the Federals, despite the exaggerations of their character from Southern rumors, were much like the supposed gentlemen of the antebellum South, if not more gentlemanly than those currently surrounding her. Although Sarah Dawson didn’t necessarily consider herself a ‘secessionist,’ she still had fervent patriotism for the southern states. Her antebellum upbringing and desire to uphold correct etiquette altered her opinions and highlighted the flaws of those around her. Despite her embarrassment and the alteration of her preconceptions, Sarah remained loyal to the Confederate states. In this, Sarah is unique from other Confederate diarists. She admits her shortcomings and overcomes prejudices while still being true to herself, her family, and her country. This entry was posted in Civilian, Memory, Personalities, Western Theater and tagged Baton Rouge, U.S.S. Brooklyn. Bookmark the permalink. As a teacher of “‘tweens,” I laughed out loud at the comment, “My young missus got her flag flyin’ anyhow!” Does it matter the day or year? Nope–even the best, most gently-reared young missus will fly her flag–and then feel terrible about it! A”young missus” will always lead with her heart.